I slept in this morning. I had run out of bread and felt like some toast. Or at least something full of carbs. I didn’t want to wait the 24 hours I’d need to make bread and I couldn’t be bothered with Saturday shopping, so I went off in search of a scone recipe. 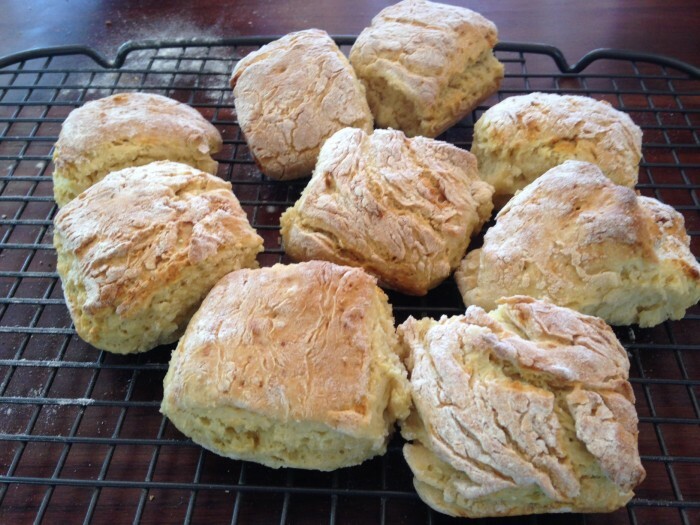 My mum used to make scones when I was a kid, using a recipe that had oil rather than butter. Google to the rescue. I quickly discovered that these oil based recipes have egg and milk in them too. No problem. I substituted the milk with soy milk and added some coconut yoghurt to replace the egg. This is the result. I ate them with some tofutti cream cheese and apricot jam. They are good. The original recipe came from an article in the Sydney Morning Herald via Gloria Hyatt from the Country Women’s Association. Pour the oil mix into the flour mix and stir until barely combined. DO NOT OVERWORK. Tip onto a floured bench top and pat out until about ¾ inch thick. DO NOT KNEAD. Cut into 9 pieces and place on a tray. Cook in a 220°C / 425°F oven for 15 minutes or until nicely golden. It is really important not to overwork or knead the scone dough - unless you like your scones tough. 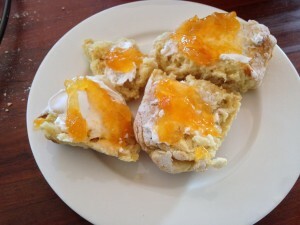 yay i just posted a scone recipe too! scones are the best.